It’s November, and we are starting down the home stretch of the college application season. That’s right, final deadlines are looming. The UC system’s undergraduate (non-transfer) applications are due November 30 by 11:59pm Pacific Standard Time (2:59am Eastern Standard Time). Many colleges using the Common Application have January 1 as their regular decision deadline. Although your first instinct might be to panic, it’s important to keep a level head. You are not the only one in this position; many high school seniors across the country are in the same situation! The key to success is to focus your time on your college applications. 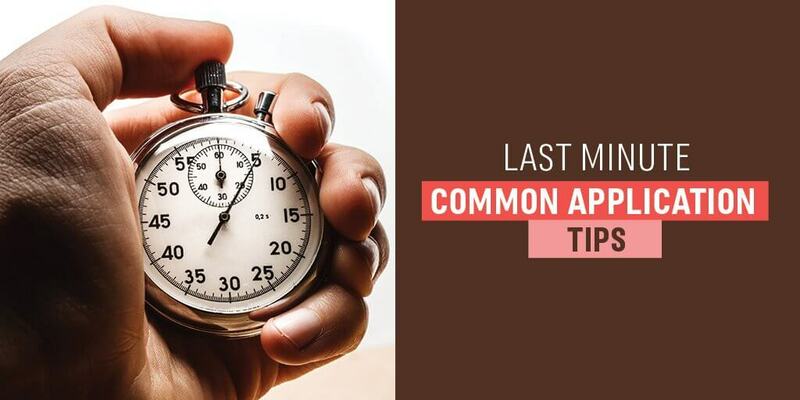 The Common Application can be fairly straightforward, but leaving any portion until the last minute will result in a more rushed effort — and likely a sloppy result. What should you be doing in the last few weeks before the regular decision deadline for the common application? Here are a few tips to help you manage your applications as you head to the finish line. 1. Give yourself time to write. Thoughtful, well-crafted essays evolve through multiple drafts and careful revisions. For a college that doesn’t require a supplemental essay, those 650 words in the personal statement are your sole opportunity to breathe life and personality into an electronic file, to convey who you are and what is important to you. Don’t miss this opportunity! If you are stumped by how to begin, take a look at my blog post with Tips for Answering Common Application Essay Prompts. 2. Think about your application from an outsider’s perspective. Is all of your data clear? Have you explained in the extracurricular section what ABCD means and your role in the ABCD organization? Keep in mind you are limited to 10 entries, each with a limit of 150 characters (including spaces!) per activity description and 50 characters per position/leadership description. Double check to make sure you didn’t omit any important information. 3. Line up and confirm with your recommenders. Take the extra minute to locate your counselor’s contact information and confirm your GPA and class rank. Make sure everything from your high school is in order. Your counselor and teachers can add value to your application. If you have not already done so, now is the time to ask teachers about letters of recommendation. 4. Proofread your college application. Don’t skip this step. Anytime you enter text directly online it leaves room for mistakes. Consider writing even your short answers in a word processing program. Then edit them and your personal statement yourself or ask a parent or teacher to read over your writing for you. Next, copy and past the text into the appropriate fields. Finally, preview your final application before submission to ensure that everything looks the way you expect. 5. Evaluate your college choices in relation to your SAT/ACT and GPA. Reach—your GPA and SAT/ACT scores are slightly below the average range for students admitted to the school last year. Good chances—your GPA and SAT/ACT scores are comparable to the average range for students admitted to the school last year. Likely to get admitted—your GPA and SAT/ACT scores are above the average range for students admitted to the school last year. 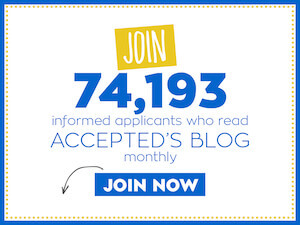 Although these numbers make up only a portion of your overall application, they are a starting point for Admission Committee members and provide a place to begin evaluation. Other factors taken into consideration might include: demonstrated leadership, unusual circumstances, extracurricular involvement, demographic information, alumni ties and outstanding athletic/musical/academic talents. 6. Allow time to upload and submit your application. Don’t wait until the last possible minute. Unexpected setbacks may occur in your personal life. Servers slow down when lots of students are trying to submit simultaneously. Browsers crash. Technical glitches happen. Sometimes, colleges will cut you some slack. Sometimes they won’t. Don’t depend on it. Your stress level will be high enough without these extra challenges. Finish early. For professional guidance with your Common Application materials, check out Accepted’s Common Application Package, which includes a-z advising that will help you create a stand out application.